I naturally have long, thick, fairly straight hair, and am not too adventurous with how I style it. Most mornings I will run my straighteners through it to help tame the frizz, or any kinks made from sleeping., but that’s about it. I’ve stuck with the same pair of straighteners for many years, never really thinking about how bad they could be for my hair. I read an article recently that detailed some brands of hair straightener can reach higher heat over time, and that the ceramic plates can loose their protectiveness. This got me thinking about my ‘trusty’ straighteners, that I’ve never felt the need to replace, and whether it was time to try something new. My hair is rather thick as I’ve said, and is often left frizzy and voluminous from blow drying. I find it hard to get that sleek and straight look, which is something the L’Oreal Steampod helps with immensely. Using a combination of high pressure steam and pro-keratin technology, this L’Oreal hair straightener helps smooth and tame unruly hair, whilst protecting it from heat damage. At first I was concerned about using a steam product on my hair. I’ve always thought that this was damaging to the hair, but L’Oreal claim that the “high pressure steam (to) deeply hydrate(s) the hair shaft before sealing the cuticles”. It is this technology that creates the sleek, smooth finish to the hair. Another great selling point to this hair straightener is it’s temperature control feature. Something my current straighteners don’t have. When you switch the Steampod straightener on, it’s automatically set at 140 degrees, which I kept it on. You can reach heat up to 210 degrees but I found that 140 was plenty hot enough for my hair. The Steampod 2.0 also contains and integrated comb attachment, which helps detangle the hair as you pull the straightener through, and spreads the hair evenly over the plates. This also means that you can straightener your hair up to 50% faster, and again adds to creating a smooth, perfectly straight finish. The white design is sleek and minimal, with a light up strip on the outer edge. The steamer pod has been designed to match the straightener, with a cord connecting the two, and has feet pads to keep it grounded to a surface, whilst you move the straightening wand through your hair. 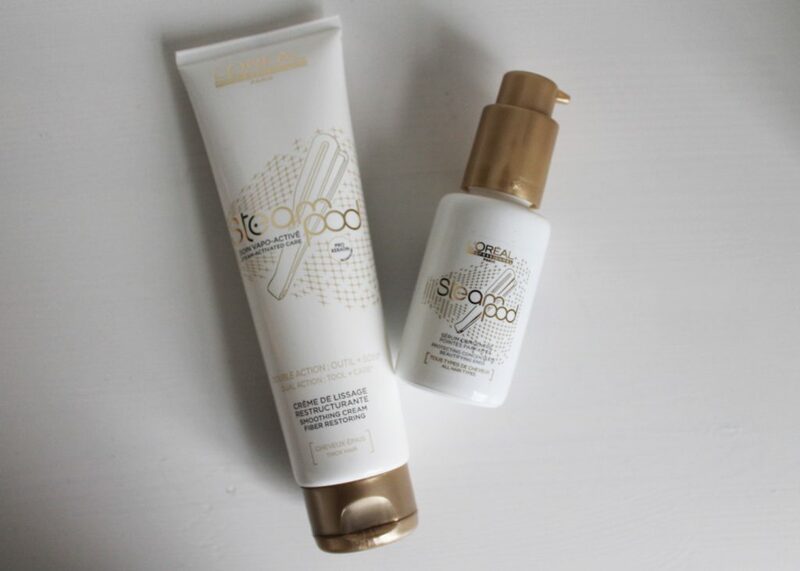 Steampod Sensitive Thick Cream £13.90 and Steampod Serum £13.90LookFantastic also stock the hair products pictured above, to use with the Steampod. The sensitive cream helps to protect your hair and can be used before or after styling. It also helps to tame any further frizz. Enriched with a blend of avocado, almond and apricot oil, the Steampod Serum also helps to protect the hair, but also to repair damaged hair. It helps replenish hair that is regularly styled with heat, making it more soft and healthy. Overall I would highly recommend this product. Although it is priced higher than many competitors, it offers a more advanced technology, that in the long term will help protect your hair. As you can see from the before and after shots above, the Steampod 2.0 straightener has certainly helped tame my thick and unruly hair, and has added a shine to it. It is a little more fiddly to use, having to top the steam pod up with water first, and getting used to running it through your hair with a comb attached. However, once you get the hang of it, it’s quick and easy to use and definitely cut down on the time I usually spend straightening. You can buy the L’Oreal Professionnel Steampod 2.0 direct from LookFantastic here.